Posted on Mon, Feb 13, 2012 : 5:56 a.m. 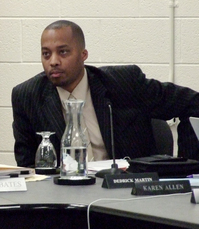 Adding another charter middle school in the Ypsilanti Public Schools could result in a “death blow” to the district’s budget, Superintendent Dedrick Martin said. Speaking at Monday’s Board of Education meeting, Martin said Central Gardens Middle School, a new charter school looking to open in Ypsilanti, could cripple the budget by attracting students away from YPS. The district currently receives a $7,514 foundation allowance per-pupil from the state. Representatives from Central Gardens Middle School said they are anticipating 160 students for their fall 2013 debut and a total capacity of 220 students. That could result in a loss of $1.2 million to $1.7 million from YPS, which Martin said would lead to a severe number of layoffs and a complete restructuring of the district’s budget. The charter school is being proposed by Excellence for Sustainability Education, an Ypsilanti-based nonprofit organization. The organization is requesting the charter to be authorized by YPS. Gina McGovern, Excellence for Sustainability Education board president, and Michele Jones, project manager, said they would like to see a partnership with YPS. McGovern said the charter issuer can collect up to 3 percent of the charter’s state aid, which is something the district would not receive if the charter is issued by another authorized body. McGovern said they are looking into other venues for authorization if the Board doesn’t issue the charter. Washtenaw Intermediate School District, Eastern Michigan University and Central Michigan University are options McGovern said they are looking into. Gerri Allen, supervisor of communication services for WISD, said earlier last week if the board authorizes the school, it will be the first local school district in the county to do so. If the proposal is rejected, Central Gardens still can apply for a charter from any other authorizing organization. It would be the third charter middle school in the Ypsilanti area, along with Fortis Academy and South Arbor Charter Academy. While presenting to the board, McGovern and Jones said the proposed school would give students in the Ypsilanti area another option with project-based, hands-on learning. “We want to offer another option to the students of the area, which could promote them to the public high school,” McGovern said. YPS board members expressed their concerns, saying a similar model will go into place this year at Ypsilanti Middle School. The New Tech national education model, which promotes project-based learning with an emphasis on technology, will be implemented at YMS by the end of the year. It is the same model currently used at New Tech High School at Ardis. McGovern said she thinks the ideal situation would be to open in partnership with YPS and attract students from a wide area. She said the next step is to give the board additional information about their curriculum and meet again to discuss the proposal. “We share the board's dream as well, and it’s a dream we want to be a part of,” she said. Wed, Feb 15, 2012 : 2:06 a.m. I've been pondering this since I read the &quot;article&quot; this morning, and a lightbulb went off. I'm closely tied to the Ypsi School District, I'm NOT an employee, but provide services that let me see clearly what is happening in the schools. Are families leaving, yes.... Why? Because the population of students maintained at the MS and HS level has an overly high percentage of students that are dangerous, using drugs, involved in gangs, disrespectful, and bullies. These students are maintained at the schools due to fear on the part of the administration (district and building level) that they will be either 1. criticized for expelling students or, 2. criticized for pushing away revenue by expelling students. Let's do the numbers here, and I'll show you the answer. 150 students in the new charter... The district is going to lose that number come hell or high water, either because the charter opens and kids who want to escape the toxic environment of the MS and HS will seek shelter there, or, think of this unique idea... rid the school of the 150 lowest performing, baddest acting students through judicious use of the discipline policy, and make the school a safe, calm place that encourages folks to stay... the $$$ impact is the same, but in the second scenario you end up with an YMS that is a good place to be. And then build on this success. The answer does not lie in keeping ALL kids in the school, the answer lies in keeping the invested kids in the school, and letting the rest go elsewhere. Fri, Feb 17, 2012 : 11:57 a.m.
Thu, Feb 16, 2012 : 1:22 p.m.
You might want to explain how you &quot;get rid&quot; or the 150 lowest performing, baddest acting students through &quot;judicious&quot; use of the discipline policy. Sounds like Nazi Germany to me. Those 150 students need us the most, but they won't be serviced at Charter Schools. And where do you suggest those 150 kids go? Tue, Feb 14, 2012 : 2:24 a.m. It's working! Republican Legislators wanted to ruin public schools with their charter initiatives. They probably gave each other high fives after reading this article. Tue, Feb 14, 2012 : 3:50 a.m.
Oh, and your children are not in the DPS are they? Not trapped in a district with a 25% graduation rate? And you want to deny children in those districts a chance at a future? How kind of you! Mon, Feb 13, 2012 : 9:02 p.m. There are several very wealthy organizations who are funding various smaller organizations to move into communities and &quot;improve&quot; the educational opportunites by establishing private charter schools - schools for profit. It is estimated by Corporate America that our country's educational system has the potential of over Seven Billion Dollars that can be taken over for personal gain. If our constititutions mandate that every child is entitled to a free education, how does one wiggle around the private for profit charter schools that are not forced to accept the &quot;difficult&quot; child, the &quot;hard to educate&quot; child as the public schools must do? Union busting is one way to save money, taking money away from community school funds for private charter schools is a way to destroy the public school system. It would seem that supporting the public school systems in each and every community would be a far more effective method of establishing excellence in educational opportunities for all children. This entails support and advocacy by every parent and every parent being responsible for their children doing what they need to do to be successful in school. Back in the day.....we took this level of commitment for granted and it worked. Successful schools had invested parents who supported the teachers Too many parent today don't commit to their children's education or to the educational system of their communities. Charter schools may be the solution for the few, but are not going to work for the whole. We are letting too many kids drop out of school in cluding those communities with charter schools. We need a well educated population - how else will we ever be able to be competitive in this world, job wise. It is not in the best interests of our children and their children to turn over our educational programming to for private profit entitities who are in it for the money. No public schools is not a future we want. Mon, Feb 13, 2012 : 11:15 p.m.
@ seasons - I agree with you. Please start the movement by enrolling your children in the Willow Run school district. Or better yet, go directly to DPS. I'll be right behind you. WOW! mythology at its best. Can you provide any references here? I would love to chase this one down. I suspect it is of a similar vein to the 1970s issue with the plot to kill drivers by putting seat belts in cars. Mon, Feb 13, 2012 : 9:44 p.m.
there are several logic leaps you make but lets just boil it down to this: under performing schools for at least 30 years. Parents volutneering, EMU students volunteering, residents volunteering - its all been happening for 30 years. And still no success. Its a wonderful dream but its not going to happen. So, what is the next alterative? Mon, Feb 13, 2012 : 6:56 p.m. The U.S. was founded, in part, on a belief in public education. They won't get better if parents pull their kids out to go elsewhere. That teaches kids that if there is a problem, they should walk away. Why not work with the schools to make them better? SO much depends on parent involvement. P.S. I went to Catholic schools for 12 years. There were few discipline problems, to be sure, but I believe that my husband got a better education, and a better understanding of the world at large, at Ypsi High. Mon, Feb 13, 2012 : 7:44 p.m.
&quot;The U.S. was founded, in part, on a belief in public education.&quot; Actually, Massachusetts passed the first compulsory education laws in the early 1850's, and it wasn't until the close of World War I that public education was mandated in all states. Even though you can find examples of public schools and even public school systems earlier than the mid-1800's, universal public education was instituted only well after the country was founded. Mon, Feb 13, 2012 : 6:19 p.m.
After schools were closed in 2005, the school district could have sold those buildings to charter schools but didn't, understanding how short-sighted that would be. How has this changed? I don't see it. I read the information from the school board packet (see <a href="http://www.ypsd.org/district/board/board-of-education-meetings-jan-2012-dec-2012/)" rel='nofollow'>http://www.ypsd.org/district/board/board-of-education-meetings-jan-2012-dec-2012/)</a> of Feb. 6, and the charter school people made it very clear that they intend to take Ypsi students--up to 220 of them. Let's not make it quite so easy for this to happen. And yes, let's also give the New Tech model a decent try at the middle school level. Mon, Feb 13, 2012 : 6:16 p.m.
Lots of Ypsi kids are leaving the district and going to Lincoln schools. As such, we've watched Lincoln schools get worse year after year. In fact, we took our 9th grader out of Lincoln High this year and put him in a *gasp* charter school! He's doing much better already; he's much happier to be around students that actually *want* to be in school, and has only complained once that they are going too *slow* in class. Lincoln was always going so slow thanks to the lack of student discipline that he was bored in class. There aren't any kids stoned or drunk around him now like there were in LHS, no students harassing the teachers, the bathrooms aren't full of graffiti and the stench of urine... so if charter schools are bad, then we'll be bad guys. Wed, Feb 15, 2012 : 11:26 a.m.
@John - well, you are sort of correct...poor families in our georgraphic area do tend to float between Lincoln, Willow Run and Ypsilanti Schools. the logic leap that Lincoln somehow doesn't have its own &quot;stoned or drunk...harassing teachers&quot; is pretty ignorant. It doesn't change your reason for moving your son...just that you clearly hae no idea who your neighbors are. Tue, Feb 14, 2012 : 11:18 a.m.
Lincoln problem is Ypsi Kids...what racist nonsense! Mon, Feb 13, 2012 : 6:40 p.m. Your condemnation of &quot;Ypsi kids&quot; leaves me stunned and nearly speechless. I suppose that Lincoln schools would be a utopia if not for these newcomers. There were no problems there before this, right? Wow. Mon, Feb 13, 2012 : 6:07 p.m.
Its easy to call yourself a non profit charter school, all within the law. How, just pay your administrators as much as the cash flow allows and bingo the salary eats up any extra and you don't have a profit on the books. Mon, Feb 13, 2012 : 10:16 p.m.
hank - The same thing happens with public schools, look at the salaries and benefits. Then they cry they are poor and need more millage money. What is the difference? Mon, Feb 13, 2012 : 5:58 p.m.
Once the public schools don't exist, then the charters that claim to be the best can start charging fees along with your tax dollars. Mon, Feb 13, 2012 : 7:53 p.m.
@hank, &quot;Once the public schools don't exist....&quot; Well if that happens, then the charter schools won't exist either because charters are PUBLIC schools. So we won't have to worry about them charging fees. Also, it's agains the law for any public school to charge tuition. But you already knew that. I think. Mon, Feb 13, 2012 : 5:49 p.m.
look, I am not a fan of all charter schools and I would love to see them all operate on a Not for Profit basis. I think Huzengia's Heritage Academies are nasty and haven't proven their worth as an example. . However, the painful reality is that Ypsilanti public schools have been at the bottom of the performance heap for a very long time. I would love to share the &quot;dream&quot; of Mr. Jackson but we've been told that for more than a generation, I no longer believe in that dream in this situation. The &quot;nightmare&quot; that Mr. Martin is worried about is coming. Its already happening - <a href="http://annarbor.com/news/ypsilanti/teacher-layoffs-expected-for-ypsilanti-high-school/">http://annarbor.com/news/ypsilanti/teacher-layoffs-expected-for-ypsilanti-high-school/</a> . Parents have been and continue to pull their kids or avoid entering their kids. So plan on it. With or without the Charter school, parents who are actively pursuing the best education available for their children are voting with their feet if they can. Now, should Ypsilanti Public schools allow the charter, they might be able to do someting truly new and innovative and get paid a little for doing it. That was my point earlier and it remains my point. Mon, Feb 13, 2012 : 5:41 p.m.
First, thank you AA.Com for waiting a week to even report this story. Second, does AA.Com do any investigative reporting (no sarcasm here, really wondering). Some of the comments are well thought out and raise some excellent issues; couldn't you pursue these thoughts and perhaps draw some conclusions? Ypsi Middle has excellent teachers and administrators, so what are the real reasons people choose charter schools instead? Isn't that one of the reasons you exist - to look into these things? If that is not part of your mission, fine - at least I'm not paying for this. If is part of your mission, this is an excellent story line to explore - do some research and draw some conclusions. Please respond, I believe most of the people who post here would appreciate your feedback. Mon, Feb 13, 2012 : 7:51 p.m.
You would think the traditional public schools would do their own study to find out why parents and students are leaving them to go to a public charter school. Oh, wait. They are too worried about the money to care about why students are leaving. Mon, Feb 13, 2012 : 4:41 p.m. If the Superintendent and all of the other &quot;higher ups&quot; were not ripping Ypsi schools off, there would be more money to spend on the students! The administration needs to take a look at their own payroll and make cuts where necessary!! Mon, Feb 13, 2012 : 3:59 p.m.
As one of the commentators above noted, a number of national and regional studies indicate that, on average, charter schools do not perform better than the local public schools from which they draw their students. Some charters do, of course, perform very well - as do some local public schools. The question is whether parents who switch schools are really getting what they believe they will receive for their children. As an education reformer once said to me, &quot;Put the word 'academy' in the name and have the kids wear uniforms, and who wouldn't send their kids to what seems to be a private school?&quot; Perhaps we should put more energy into improving our local public schools than into encouraging a large number of smaller schools that only serve a limited population. While in this case, the proposal seems to be made by a group that would &quot;self-manage&quot; the school, concerns about for-profit companies are very valid. Depending on the definition, between 70% and 80% of Michigan charter schools are managed by private, for-profit, companies. Those which disclose their management fees charge between 10-15% of the per-pupil foundation. Others do not disclose their fee structure but simply take the entire per-pupil funding as payment for running the school. Researchers have estimated that one large firm keeps approximately $1,000 per student per year as its fee. We have supported amendments to each charter school expansion bill that would require charters to be self-managed or managed by a non-profit (501c3) firm, but these amendments were defeated each time. There are also two proposed constitutional amendments banning for-profit firms from substantially managing a K-12 school, though the majority in the legislature is not likely to allow them to ever come up for debate. If this issue concerns you, contact your lawmakers today! Tue, Feb 14, 2012 : 2:47 p.m.
DonBee, There's a huge difference. When a charter school management company arrives, they typically provide everything from the building itself to the books, computers, staff - everything. When the management company leaves, they take all of that with them. Not that the management company leaves very often. Most charter schools aren't governed by a truly independent board. Instead, the management company packs the board of directors with &quot;friendlies&quot; that won't challenge the management company on any substantial issues. Worse, management companies (e.g., National Heritage Academy, for one) typically BUILD and OWN the building in which the charter schools they manage actually operate. NHA leases the building back to the charter school board, often at exorbitant rates (think in excess of $1M per year - well out of line for commercial real estate), year after year and well after the construction and operating costs for the building have been recovered. Were somehow the board ever to dismiss the management company, the management company would leave with everything - the building, the books, the furniture, the staff, the computers, the software - literally everything but the effectively worthless piece of paper that the charter authorization is printed on. It's a sweetheart arrangement (for the management company, anyway) but there is no genuine independent oversight of charter schools at the board level. In a clear conflict of interest, the board at any given charter school is appointed by the management company, which in turn, is supposed to monitor the management company. It would be as though the people at Balas got to appoint the AAPS School Board. How would THAT sit with you? Mon, Feb 13, 2012 : 10:15 p.m.
Mr Norton - The administration costs (general and building) is in the same range you cite. What is the difference? Mon, Feb 13, 2012 : 7:49 p.m.
@Steve Norton, Obviously you just accepted what one of the commentators said as fact instead of looking up the studies yourself and see what it actually said. In the same study that the commentator posted, it said that Charter school students do better on college entrance exams (SAT ACT) than the traditional public schools. In one study that the commentator posted, the study showed that 63% of the charter schools performed better or the same as public traditional schools. Not bad, eh? In another study that the commentator posted, the Chairman of that study said &quot;The pilot study was a trial, however, and the need for caution in using the results is apparent.&quot; Ah, but the commentator that posted the study did not want you to know that. Some of the studies only looked at 150 charter schools and two subjects. Hardly a study to make a case for or against charter schools. Mon, Feb 13, 2012 : 3:38 p.m.
Mon, Feb 13, 2012 : 10:13 p.m.
Floyd - So it is OK to pay the AAPS superintendent $250,000 a year because it is a PUBLIC school, but not to pay similar amounts to charter executives. Got it! Mon, Feb 13, 2012 : 8:51 p.m.
&quot;We are seeing the vanguard of an army of carpet baggers and shysters who will be making money hand over fist while claiming that it's &quot;best for kids.&quot;&quot; Count Floyd, are you describing the MEA? Mon, Feb 13, 2012 : 7:43 p.m.
@Floyd, Don't you think the parents know what is best for their children? Or should they just let the government and unions tell them what is best? It is quite obvious that parents realize that Charter Schools are better for their children than the traditional public schools. Instead of the traditional public schools trying to figure why that is the case and fixing the problems (if the unions let them) they are more worried about the money. Mon, Feb 13, 2012 : 5:42 p.m.
Mon, Feb 13, 2012 : 3:36 p.m.
Who cares? Ypsi schools are awful. At worst, the charter schools would perform on par with the public schools. Seems worth a gamble to see if the charters can beat the public school option. Mon, Feb 13, 2012 : 10:12 p.m.
Floyd - mmppcc's list of reports is hardly credible. No report that I have read (and I am 15 in so far) is. Mon, Feb 13, 2012 : 7:40 p.m.
@Floyd, Did you not dig deeper into MMPPCC's list of &quot;credible&quot; reports? In the Stanford report he referred to he left out the fact that 63% of charter schools perform about the same or better than traditional public schools. Not bad, eh? In the &quot;credible&quot; reports that he cited, it was also noted that Charter School students performed better on college entrance exams (SAT, ACT) than the traditional public school students. In some of his reports that he cited only studied 150 charter schools to come up with their conclusion. And here is the Chairman of one of the studies:&quot;Darvin Winick, Chairman of the National Assessment Governing Board, &quot;The pilot study was a trial, however, and the need for caution in using the results is apparent,&quot; Winick said.&quot; One really needs to look further into the &quot;credible reports&quot; before spouting off the numbers as proof of something. Mon, Feb 13, 2012 : 5:46 p.m. I would like to know more about the basis of your conclusion that &quot;Ypsi schools are awful&quot;. It's also great to see you don't seem to mind gambling with our children's education. Classy. Mon, Feb 13, 2012 : 3:43 p.m. Didn't you bother to read MMPPCC's list of credible reports showing that charter schools perform worse than public schools? So at worst, this school will be a disaster for the community, and at best it won't do as well as a public school. In terms of spending very limited resources, this school is an empirically poor choice. Mon, Feb 13, 2012 : 3:07 p.m. This charter school does not seem to have a profit motive as it is being chartered by a NON-PROFIT org. Your argument is invalid. Mon, Feb 13, 2012 : 5:44 p.m.
Oh, really? Are they doing it to feel good? Please check on the salaries of the people in charge, maybe that will give a little more insight. Perhaps not, but it might be interesting. Mon, Feb 13, 2012 : 2:58 p.m. I'm glad to see that most of the people making comments here aren't fooled by these charter schools. They have two motives, profit and destroying the public school system. Mon, Feb 13, 2012 : 3:13 p.m. If the traditional public school system is working so well, then what is the worry? Parents would be happy and leave their children in the system. But obviously that is not the case because parents are taking their kids out of the traditional public school system for a reason. Maybe it would be wise for the traditional public schools to find out WHY parents and kids are leaving and opting for the charter public schools. That would be the smart thing to do instead of complaining about how much money they are losing and trying to protect union jobs. Remember, it's about the kids and not the money. Mon, Feb 13, 2012 : 2:14 p.m.
Mon, Feb 13, 2012 : 10:10 p.m.
Forever27 - Trap high performing students in schools that require metal detectors and where if you excel you are a target? In schools like DPS where the graduation rate is 25 percent? Sound good? Mon, Feb 13, 2012 : 3:09 p.m.
@Forever27 Care to share how charter schools &quot;co-opt all the best performing students away from public schools&quot;? How do they do that? This ought to be good! Mon, Feb 13, 2012 : 1:51 p.m. I am always skeptical of these &quot;not-for-profit&quot; corporations that run charter schools. They may not have shareholders, but they certainly make a profit and their upper management is at times very well paid. They also, in many cases, have a curious way of out sourcing many functions to highly compensated consultants and consulting firms. It might be worth that cost if charter schools were shown to produce better results. They are not, even when they can limit themselves to the &quot;good&quot; students. Mon, Feb 13, 2012 : 11:14 p.m.
Mon, Feb 13, 2012 : 10:09 p.m. The schools are by definition not for profit. They can hire a management company. Just like public school districts hire (outsource) buses, lunches, substitute teacher management, legal firms and other for profit organizations. The difference is? Mon, Feb 13, 2012 : 1:07 p.m. This charter school is just another step in the movement to destroy public schools in the name of competition. Remember this movement was started in 1991 by the arch enemy of public schools in particular and public institutions in general, then governor John Engler. Accelerated by tea party elements and the Republicans in Lansing, the charter school movement is full steam ahead, with some of its advocates infiltration the public school system itself, case in point Doug Ross being hired by Detroit Public Schools. This is dangerous. Wed, Feb 15, 2012 : 8:44 p.m.
Lori, If you want to talk about early education, you can find plenty of research that discusses parental academic attainment as a predictor of early education success, but specifically at the HIGH SCHOOL level, far more relevant predictors of success in secondary education settings include: • Attendance • Achieving grades of B or better in 9th grade • Relative poverty • Behavioral problems • Parental involvement in middle childhood • Supportive parental relationships in early adolescence • Positive teacher-student relationships • Demonstrated social competence when interacting with adults My statement applied to individual students. I simply said that any student can succeed or fail. What an individual student does in high school is a far more reliable predictor of his/her success than what high school the student attends or how many degrees his/her parents have. For example, my mother was a high school graduate and never went to college, but all of her children graduated from college. Her level of educational attainment was NOT a reliable predictor of mine or any of my siblings'. At the same time, while all of my siblings and I graduated from college, only a few of my sisters' children graduated from college. Again, the mother's level of educational attainment was not predictive of the educational success of their children. My mother-in-law has a PhD. Neither of her children have achieved that level of educational attainment, although they both have first-level college degrees. My point is that your predictor (Mom's education) doesn't work at the individual level. There are other factors that exert a much greater influence on student success in the secondary education environment. Wed, Feb 15, 2012 : 12:26 p.m.
@Ypsiliving...you were good until your summary statement and that was utter rubbish. The single most direct indicator of how well your student will do from an education perspective is the educational background of that student's parents (specifically mom's background). If you need study references, I will provide them. I don't have a conclusion other than the destruction of the academic performance here in Ypsilanti schools and, therefor, first steps in destruction of public education in Ypsilanti started wayyyy long before Engler. I was in college in the mid 80s. Ypsi schools had a terrible rep then and people pulling their kids then. This current state of affairs is just a continuation of a very long term problem. Tue, Feb 14, 2012 : 3:18 p.m.
jns131, There are currently four charter high schools in Washtenaw County. They are: Arbor Prep Central Academy Washtenaw International Baccalaureate Washtenaw Technical Middle College Likewise, there are two statewide online charter high schools and by the fall, there will likely be more online options. The graduation rates for Washtenaw County traditional public school districts for the 2009-2010 year (the last year for which stats are available) are: Ann Arbor (all high schools) 89.71% Chelsea 94.69% Dexter 94.50% Lincoln Consolidated Schools 74.79% Manchester Community Schools 94.25% Milan Area Schools 69.44% Saline Area Schools 92.49% Whitmore Lake 88.60% Willow Run 50.40% Ypsilanti 62.40% (As a side note, based on the way graduation rates are calculated by the state, do not assume that the dropout rate is the difference between 100% and the district's graduation rate. In other words, Willow Run does not have a 49.6% dropout rate; it's calculated drop out rate for 2009-10 was 36%.) To your point, four other WashCo school districts have higher graduation rates than Ann Arbor's &quot;almost perfect&quot; score. It's probably safe to say that any individual student in any school district *can* succeed wildly or fail miserably. At the high school level, the single largest determinant of student success is most likely going to be the student himself/herself. Mon, Feb 13, 2012 : 10:23 p.m. I believe the stats were out for Willow Run. I think they had a less then 50% graduation rate. Then I believe Ypsilanti was after that. Then there is Ann Arbor with an almost perfect graduation rate.So definitely choose who you would rather teach your children and where. I know there is only one hi school charter in the area. So choose wisely. Mon, Feb 13, 2012 : 10:08 p.m.
hermhawk - So we should trap children in districts that graduate under 25 percent of their students, like DPS? Is that OK? If, not, then give me an answer that is better than charters. Mon, Feb 13, 2012 : 7:28 p.m. Apparently the traditional public schools aren't interested in improving. They are only interested in the money. Mon, Feb 13, 2012 : 4:01 p.m.
How about helping it to improve, instead? Helps the kids, helps the community. What's wrong with shutting down a school that is performing terribly? Care to share how this is dangerous? Mon, Feb 13, 2012 : 12:48 p.m. Ineffective teachers? We need this school? Study after study yields the same results, that charter schools do not out-perform public schools. The only goal for charter school advocates is lowering compensation for school employees, and in the case of for-profit schools, making a lot of money for themselves in the process. Let me let you people in on a little secret. The teachers at Ypsilanti are the same teachers at Saline. They come from the same middle class backgrounds, have the same professors at the same schools of education. Now, let's see if you can figure out what is different. Could it be the students, the parents, the communities? So, Ypsilanti, go ahead and destroy your public schools. It won't solve anything. You'll be left with a bunch of terrible charter schools filled with the same teachers you think of as ineffective. They'll just hate their jobs. Citizens of Ypsilanti, there is an easy way to figure out why your schools are lousy. Just look in the mirror. Mon, Feb 13, 2012 : 10:06 p.m.
mmppcc - The CREDO study is so flawed that even Stanford has allowed rebuttals to be posted on the website at the school. They disavow the methodology. NAGB admitted they did not deal with the impact of students changing schools and the loss of progress this brings. Also they admitted that if you removed 1st year schools, and first year transfers the numbers changed dramatically. As to your book, look deeply into the background of the authors and you will understand the bias in the book. I have yet to find a reasonable study on this question. We need good unbiased data and better analytical tools. As far as I am concerned the jury is still out. As to Ypsi - the schools of choice will do as much or more damage to Ypsi in the next couple of years than Charters - I don't see you railing against AAPS or Milan opening their doors and stealing students from Ypsi. Is this OK? Mon, Feb 13, 2012 : 9:59 p.m.
@mmppcc It's no fantasy when it is evident that a chairman of the study that you used said &quot;The pilot study was a trial, however, and the need for caution in using the results is apparent.&quot; It's no fantasy that the very study you cite as against charter schools says that the charter school students perform better on college entrance exams (SAT, ACT) than those students in traditional public schools. And you don't think a book against charter schools is flawed when in it they did a study of just 30 charter schools to make a point, but yet in another study they decided to use 50 charter schools to make a point? I am sure if you add more schools to a study or less schools to a study, you can make any point you want. You can't make this stuff up. Mon, Feb 13, 2012 : 9:10 p.m.
Mon, Feb 13, 2012 : 8:57 p.m.
@mmppcc As with any study, for or against, it is important to tell the whole story, or to show the whole study. Not just the part that supposedly fits the agenda you are trying to push. If you want to use a study that even the chairman of that organization says &quot;&quot;The pilot study was a trial, however, and the need for caution in using the results is apparent,&quot; then so be it. If you want to show a study that uses 30 charter schools to make its point that traditional public schools are better, so be it. It is quite obvious that the studies that you cite are flawed and not representative. Mon, Feb 13, 2012 : 7:57 p.m.
&quot;So that Stanford report you referred to....let's see....According to its study, 63% of charter schools are about the same or better than public schools. Not bad. No wonder parents are moving their kids to Charter schools.&quot; WHAT? So, by your logic, 83% of traditional public schools the same or better than charter schools? I can't believe I'm wasting my time arguing with someone who doesn't understand basic statistics. Mon, Feb 13, 2012 : 7:39 p.m.
maallen, you snidely asked for three studies. I gave you three studies. Now, your only rebuttal is to attempt to discredit the research and accuse me of omitted parts of it, just because you don't like the results. Read the rest of the posts. People aren't gullible enough to buy what you're selling. Mon, Feb 13, 2012 : 7:27 p.m.
@mmppcc, So that Stanford report you referred to....let's see....According to its study, 63% of charter schools are about the same or better than public schools. Not bad. No wonder parents are moving their kids to Charter schools. In that same study, I like how you conveniently left out how Charter School kids score BETTER on SAT and ACT scores than the traditional public schools. And you conveniently left out how charter school students are more likely to graduate highschool than those of the traditional public schools. And this is according to the Center for Public Education. Also, unfortunatly, the Harvard study that you have provided as &quot;proof&quot; is hardly a representative study. The study only focused on 15 states and two areas of subject. matter, english and math. You referred to the study by the National Assessment Governing Board (NAGB) which released an analysis of charter school performance on the 2003 National Assessment of Educational Progress (NAEP), also known as The Nation's Report Card. But you conveniently left out this: &quot;Darvin Winick, Chairman of the National Assessment Governing Board, "The pilot study was a trial, however, and the need for caution in using the results is apparent," Winick said.&quot; The study you referred to looked at only 150 charter schools. It was not a comprehensive study and the chairman himself said &quot;and the need for caution in using the results is apparent.&quot; Yet you are using it as &quot;proof&quot;? The Charter School Dust up book you refer to was written in 2005 and only studied 13 states and about 157 schools. And when referring to individual studies it did, it would only take statistics of 30 schools, or in another study 20 schools, etc. Again, hardly representative. I really thought you would do better than offer up these light weight studies. Oops, sorry. Didn't see that last paragraph. But by how much do they &quot;do worse&quot;. I'd rather have my child do &quot;a little worse&quot; than being afraid to go to school every day. Mon, Feb 13, 2012 : 5:45 p.m.
Do the charters under perform? If performance is about equal, then other factors come into play like, is my child safe? Are the school's hands tied when it comes to disciplining disruptive students? Mon, Feb 13, 2012 : 3:27 p.m.
@mmppcc &quot;Study after study...&quot; Since you claim there are so many studies out there to prove your point that charter schools do not out-perform public school do you care to share, oh let's say 3 of these so called studies? We will be waiting for you to share 3 studies. Mon, Feb 13, 2012 : 11:39 a.m.
Parents are voting with their feet and will continue to. Given that the exodus will continue with or without another charter school, Mr. Martin's projection seems more like something he should be planning on rather that some sort of alarmist reaction to a Charter School proposal. The question becomes how do you keep Ypsilanti students in any kind of school in Ypsilanti so that families can continue to choose to live here? Or that companies here won't openly recommend that their employees live elsewhere? It may be that we need this new school. Mon, Feb 13, 2012 : 11:03 a.m.
Tue, Feb 14, 2012 : 12:20 a.m.
Mon, Feb 13, 2012 : 5:29 p.m. Blame the unions. They are the ones that really hold the purse strings. In this case the teachers are balking and so is admin because they know that they are the ones that are loosing to non union jobs. The teachers at the charters may not make a lot? But when mine was there? The teachers cared. Ours is now in a public hi school and I like where she is at. So far.